Help Prepare a Bushwick Playground for a New Mural! An organization with nearly 50 years of experience connecting artists and youth for public art projects is planning a Bushwick project—but they can't do it without you! Sunny summer days are perfect for helping kids make vibrant public art! 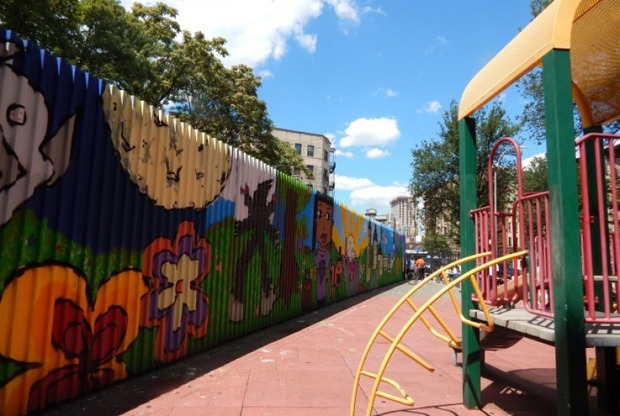 The long tenured, New York-founded international organization CityArts is working with the Parks Department and the Board of Education to bring a colorful mural to Garden Playground, the busy public playground adjacent to Bushwick's P.S. 120 Carlos Tapia. Cityarts-vetted artists will join forces with Bushwick children to design and create a mural on the playground's walls that will reflect the kid's ideas about what makes their community unique. Cityarts, which proclaims on its site that it is "widely credited as the pioneering force in the creation of the contemporary community mural movement in New York City," has been an active force in New York's public sphere since 1968, when it was founded as Cityarts Workshop. The timeline for the Garden Playground project has not yet been announced in its entirety, but a first step for which the organization needs the public's help has been planned. Next Monday, July 18th, Cityarts invites Bushwick residents to join them at the site from 10 a.m. until 4 p.m. for a "priming party" to ready the walls for the kid-designed mural. All are welcome, and work clothes are recommended.